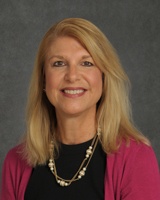 Lenore Lamanna, RN, EdD, ANP-C is an associate professor in the School of Nursing at Stony Brook University. Dr. Lamanna completed her EdD at Teachers College, Columbia University, a Master of Science in Nursing as an Adult Nurse Practitioner at Stony Brook University, a Bachelors of Nursing at St. Joseph’s College, and an Associate Degree of Nursing at Suffolk Community College. Dr. Lamanna has taught at Stony Brook University for over twenty years and is an expert in undergraduate and graduate education of Masters of Education students and Adult/Gerontology Nurse Practitioner students. She practices as an Adult Nurse Practitioner in Gastroenterology. She has many years of clinical experience in dermatology. She is an active member of Sigma Theta Tau International, Kappa Gamma Chapter, the Nurse Practitioner Association of New York State and Long Island, the Crohns Colitis Foundation, and the Society of Gastroenterology Nurses and Associates. Dr. Lamanna’s research interest includes diverticular disease, evidence based practice and interdisciplinary education. Byers, A.M., Lamanna, L. (2010). The Effect of Motivational Interviewing after IschemicStroke on Patient Knowledge and Patient Satisfaction with Care: Journal of Neuroscience Nursing, December 42(6) 312-322. Lamanna, L.: Be on the Lookout for Skin Cancer, American Journal of Nursing,  August 1996 16A-16D. Lamanna, L. (2002) College Students Knowledge and Attitudes about Cancer andPerceived Risks of Developing Skin Cancer. Doctoral Dissertation, Columbia University. Lamanna, L. (2003) College Students Knowledge and Attitudes about Cancer andPerceived Risks of Developing Skin Cancer. Dermatology Nursing, April, 2004.